It's everything I hoped it would be. Thanks Ray! Ever since I was forbidden by my parents to send my allowance to the "shysters" who advertised amazing novelties in my comic books, I've grown more and more obsessed with tracking down the treasures I was denied. Many of these items turn out to be as fraudulent as my parents had warned, but that just adds to their appeal. So here's my question for all of you mask experts and/or people who were allowed to order from comic book ads: Was this mask ever sold through the Johnson Smith ad (shown at the top of the post)? The mask shown above is from the late 80s or even early 90s and therefore it was not "the one." 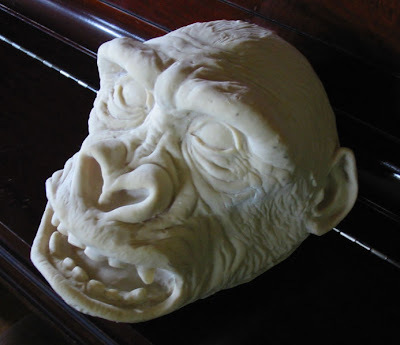 The mask was made by Topstone, the preferred mask supplier for Johnson Smith, Honor House and other mail order folks. 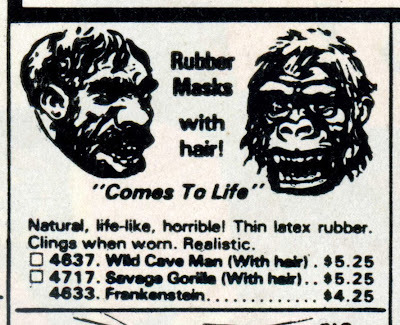 I realized my gorilla has no teeth, but certain ads ran for many years, and novelty companies had to use different models of the products, even though the original illustrations were still shown. So I thought it possible that mine could be one of many varieties that were offered. I've learned that this one was offered much earlier than the Johnson Smith ad and probably wasn't sold through them. 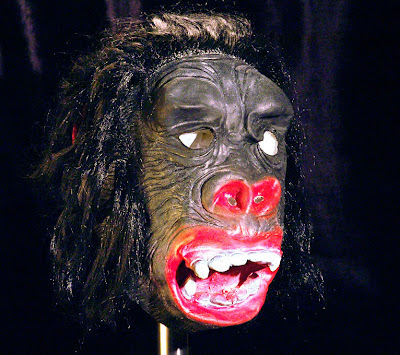 Then there were my other theories that involved this design or the mask Ernie Kovacs used as props on his show. Alas I think the truth has been uncovered. Ask them over at the Universal Monster Army, they really know about things like this. Corpse- that's really what I should have done from the start. I'm even a member at UMA though of the lurking variety. Both of the experts who helped me are in the army as well. The UMA is one of our national treasures! Kirk, looking at these masks make me want to see more. You should do some more posts on masks!!! Yes, masks for a year! Growing up obsessed with King Kong and Planet of the Apes I know how you feel about this ad... I always wanted that mask too and was just never allowed to get it. Great post! Ooh, Ooh! You should do a countdown list of great masks! You know we'd all wait anxiously for each post as usual. 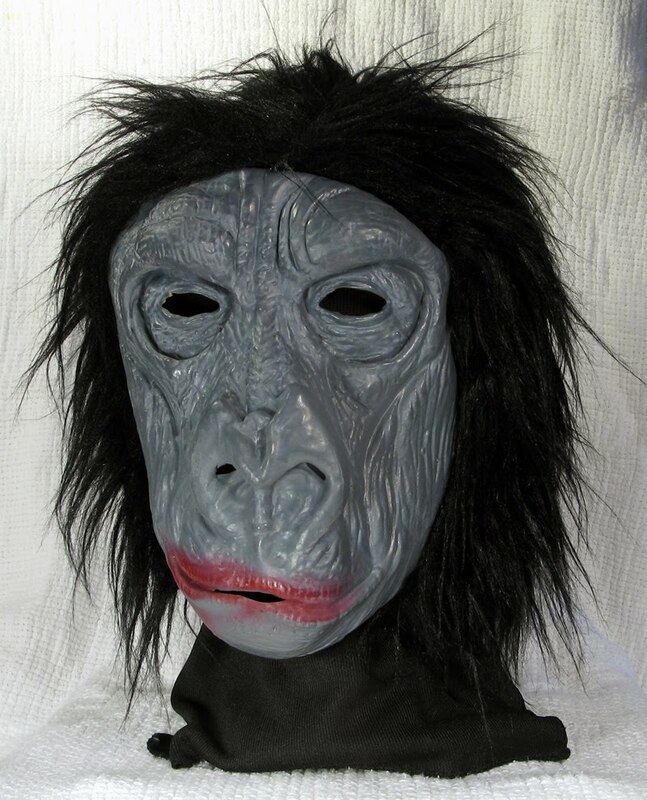 Thanks for helping me determine the EXACT mask my older cousin used to terrorize me as a child. I can still see him riding up on his Honda motorcycle wearing that thing. I ran in fear. Is Johnson Smith still in biz? I used to order so much stuff from them in the 70s. My god. 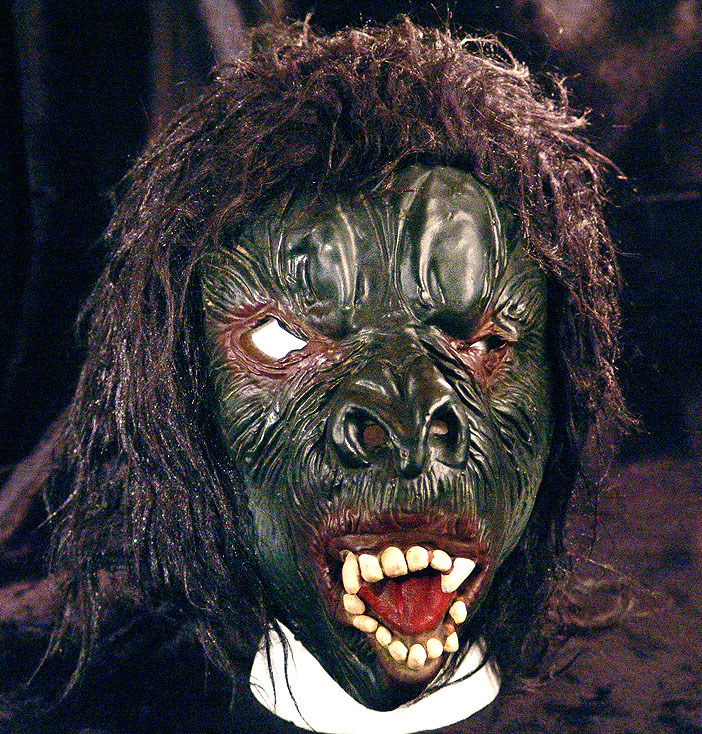 ps: I had ordered the Wolfman mask and can easily ID it if it ever comes to light. Haha. karswell- I still don't know what the Johnson Smith Planet of the Apes mask was. The quest continues. Giddy vintage- That would be fun although if I were using my own it would only run about a week and a half. Darrin- yeah, me too, and even if I had managed the money, actually sending it was an insurmountable task. Jody B.- Is it odd that I count you lucky for that experience? Kirk, thanks. This blog is awesome. Unfortunately, that's not the Johnson Smith mask I had ordered back in 1976, but I could pick it out in a line up for sure. It was very thin dull brown latex with BUMPS all over it, as if to imitate the fur effect. I distinctly recall opening the package and being disappointed. At that very moment, my dad then put on the mask and headed outside in the deep snow to get the garbage cans, embarrassing me even more at the time (but confirming , retrospectively how cool my dad was, and is -- haha). I'll keep looking. Those Johnson Smith products open up memory banks that have been closed for decades. It's a real treat to see this stuff here, and elsewhere. Thanks again. That's such a great dad move that you described. 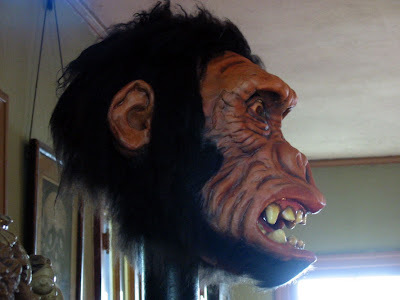 I wonder how many different werewolf masks they used throughout the years (I've been told that the one in the link was definitely used at some point by one of those mail order companies), but I'd love to know the exact mask that you got. I'm glad to hear that you're enjoying the blog! I've got other Johnson Smith stuff that will certainly surface here at some point.